The drama "Gishinden Yomikiri Kôshaku" was premiered in the 2nd lunar month of 1788 in Ôsaka at the Ônishi no Shibai [more details]. Act III ("Asakusa Kannon") and Act IV ("Uekiya") were staged independently from the beginning of the 1790s, either in puppet theater or Kabuki, under the title "Chûshin Renri no Hachiue". It was commonly entitled "Uekiya" ("The Gardener" in English). The original drama "Gishinden Yomikiri Kôshaku" was in 8 acts. The current version of "Uekiya" is made up of two acts (3 scenes). These two acts are Act III ("Asakusa Kannon") and Act IV ("Somei Uekiya") of "Gishinden Yomikiri Kôshaku". In those days, as it was the usual case with samurai of high rank, the clan of the evil Kô no Moronô lived in a fine mansion with traps, concealed doors and secret emergency exits. Kô no Moronô and his retainers took a lot of precaution to prevent any attack from late En'ya Hangan's rônin. Therefore, it was a matter of urgent necessity for these rônin to get the plan of the mansion of Moronô in order to successfully carry out their revenge plot. The characters' costumes and manners in this play are those of the Edo period, but as for the characters' names, those of the Muromachi era are adopted. It was a simple way to avoid censorship. The role of Yashichi (in reality Senzaki Yagorô) is performed in the Kamigata wagoto style of acting. Although the story is set in Edo (in the popular district of Asakusa), "Uekiya" is considered as a kamigata kyôgen and is closely associated to the Nakamura Ganjirô line of actors. In front of the Asakusa Kannon (Sensôji), there stand in a row a chaya, a misemono-goya, a dôguya, a karakuriya and an uekiya. Koharuya Yashichi and Uekiya Mokuemon have small shops here. The former works at the Koharuya dôguya and the latter is the owner of the Somei Gardener shop. Tashirô's sister Oshin (Tashirô is the owner of a karakuriya near the Somei shop) and Mokuemon's sister Oichi come to bring lunch to their brother. Yashichi is popular with these girls, and persistently wooed by them, though he treats them lightly. Then his lover, the koshimoto Otaka who is at the service of Moronô, appears on stage. Once, when Otaka visited the Asakusa Kannon, she happened to meet Yashichi. Before long they fell in love. She has secretly understood that Yashichi is in reality one of En'ya Hangan's rônin and that his real name is Senzaki Yagorô. She is also aware that her lover has started a relationship with her also in order to make use of her, but she cannot help loving him. She heartily wishes to help him in his revenge against the evil Moronô. She would also be the happiest woman in Edo if she were called his wife. At first Yashichi can't see what she has really meant, but after a while, coming to know she deserves his confidence, he asks her to spy out the very complicated layout of the mansion of the Kô clan. Two samurai in disguise of tradesmen are keeping watch on Yashichi. One is the karakuriya Kurohachi, in reality Ôsuga Danpachi, a Moronô's retainer. The other is the karakuriya Tashirô, the brother of Oshin, who is in reality Kondô Genshirô. Genshirô used to be a retainer of En'ya Hangan but he is now in league with the evil Kô no Moronô. Both men exchange pieces of information and Tashirô leaves the stage. Kurohachi, overhearing Yashichi's talk to Mokuemon (who is in reality En'ya Hangan's faithful rônin Takemori Kitahachi) that he has got a way of getting the mansion plan, attacks Yashichi, who cuts him down. Yashichi's strike ends the scene. The servants are cleaning the Somei gardener shop to welcome an important customer. Tanemori Hyônai, a kerai of the Kô clan appears on stage. Yashichi, who happens to be at the entrance of the shop, greets him in place of the Somei master. A kago stops at the front and out comes Oran-no-kata. Yashichi is astonished to find that Oran-no-kata is none other than his lover Otaka. Affectionately he approaches her but she turns her face away saying that he is mistaken and she is not Otaka. To the stupefied Yashichi, Hyônai tells that she is a mekake belonging to Kô no Moronô. Yashichi is enraged at her disloyalty. While Hyônai is reproaching Yashichi for his rudeness, Mokuemon appears on stage and eyes him to endure silently. Mokuemon introduces him to Hyônai as a servant and sends him on some errand, but being angry he will not obey. 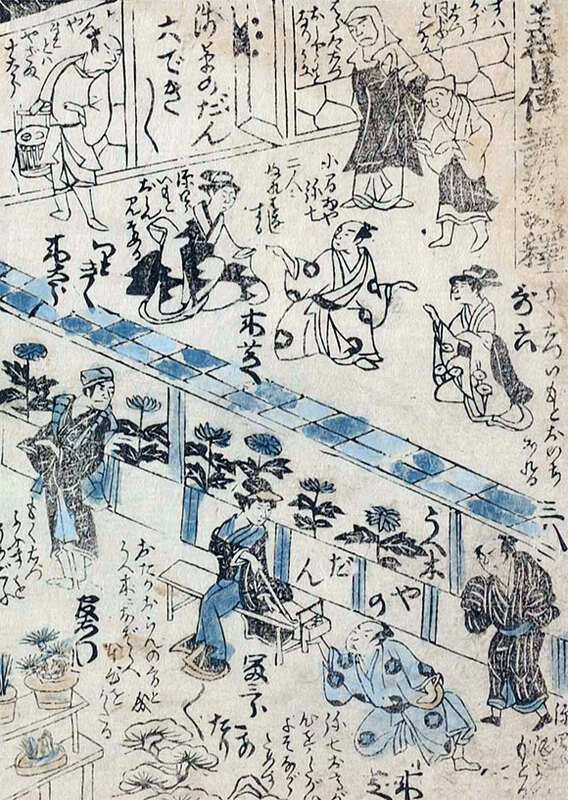 So Mokuemon leads Oran-no-kata into the garden on the pretext of showing flowers because it is impossible to have a private talk at the bustling entrance of his shop. Yashichi, left alone, makes some assumption about the treachery of his lover. He believes that it was not her will to become Moronô's mekake. She may have spoken those cruel words because she had to ignore Yashichi in the presence of others. Thus thinking, he reaches the conclusion that he was betrayed and that he must kill her as there may be a possibility of her disclosing his secret. Oran-no-kata comes in to tell Yashichi the truth. But she is stopped by some koshimoto of the Kô clan and goes to the garden reluctantly. A vocal solo of the famous love story of Sankatsu and Hanshichi (sankatsu-hanshichimono) drifts into the garden from the neighboring house. Oran-no-Kata compares herself to Sankatsu in the song and with an appealing look tells the story of Sankatsu alluding to her miserable fate. Just like herself, Sankatsu was forced to become a mekake of a daimyô. Sankatsu thought of killing herself, but she was determined to obey her new master to fulfil her mission. She was deeply worried what her lover would think of her. How she wished she could be called his wife forever, clearing away Hanshichi's suspicion. Yashichi is still in doubt and cannot forgive his lover easily, but he gradually understands what Oran-no-Kata really means when she tells the story of Sankatsu. Otaka has loved Yashichi so passionately that she was eager to give her hand to him but she was forced by her master to become his mekake against her will. As an answer, Yashichi praises Sankatsu (a subtle way to say Otaka) for her virtuous deeds. His words make Oran-no-Kata happy and she hands him the plan of Moronô's mansion, pretending as if she were paying the money for the plants. Oran-no-Kata enters into the kago prepared for her. The moment the kago is lifted, drops of blood trickle down. Yashichi immediately understands that Oran-no-Kata has committed suicide. He folds his hands in prayer to thank her for her courageous help and self-sacrifice.